Road Tests and Reviews visited Paris to experience Avant Garde. Jeremy Webb attended the launch party for the DS7 Crossback, taking place in Paris. When DS Automobiles and DS Performance invited me to drive a DS7 to France, attend a launch party for the car and also watch the Formula E Grand Prix, taking place in Paris. It was an offer too good to turn down. Luckily I was the chosen team member given the opportunity. A DS7 was delivered to my house which I drove to Folkestone where I met several other journalists, also reviewing the car. Four DS7 Crossbacks boarded the Eurotunnel early Friday morning, then crossed the channel. Once in France, we drove in convoy to Paris arriving in three hours. We pulled up to the Hotel Molitor within seconds our luggage was taken and the cars valet parked. I then had three glorious days in the hotel being treated like a celebrity. The staff were fantastic, always smiling, friendly and above all helpful. Entering my room I beamed as I saw the view to the outside pool. All rooms in the hotel have a view of the famous outdoor pool, which lights up at night and changes colour. The room was luxurious, with a huge bed, lovely linen and all the amenities guests require. DS X E-Tense. 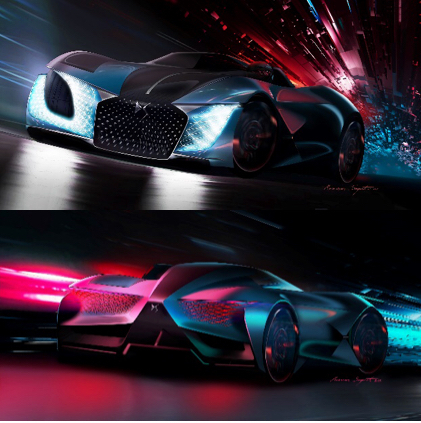 DS Automobiles and DS Performances’ imagination of future transport. The design team was given free reign to create a car from their dreams of what they could envisage a car being like in 2035. I interviewed Arnaud Ribault, SVP DS Automobiles and Thierry Metroz, DS SVP, DS Design who told me they took ideas from nature, museums, art and even poetry. Often sending photos to each other from art galleries or buildings they visited. They were passionate about the E-Tense and rightly so. Seeing the images of the car on a large screen, it is truly beautiful and new. It is asymmetric, with one side being for the purist driver who wants to have control and enjoys fast, fun driving. The other side offers tranquility, relaxation, and autonomy. You are driven by the car itself, cocooned in luxury, safety, and technology. No steering wheel, no display as we know it. Films, Television, and information will be projected on to the windscreen. Red and Blue define the choices the owner has. Avant-Garde art in a car, which will combine skills from the fashion industry, and other artisan crafts along with cutting-edge car manufacturing technology. This will then drive forward what can be done on future DS cars before 2035. New materials, new ways of using LED lights, new thinking. The car is beautiful and shows what can be done when people are driven by imagination and not confined by boundaries and budgets. The car has a clear canopy and electro-chromatic glass floor providing flashes of the road. A third seat allows for two passengers in the autonomous side of the car, where they can interact with IRIS, a hologram that takes care of the functions. The pilot as DS label them, is not enclosed, feeling the elements, speed and being at one with the car. The passengers enter via a Gull Wing door, in to a sensuous capsule. The seat can massage them, while they choose their entertainment for the journey. The DS X E-Tense is very light, and silent allowing great performance for passionate drivers. Each front wheel has an electric motor, producing in total 400kW equivalent to 540 HP for normal use. In Circuit mode 1,000kW or 1360 HP is released giving the driver great enjoyment. High tech developed in collaboration with the DS Formula E programme means the advanced active system keeps the suspension trimmed, and traction control makes sure all power from the wheel is put on to the road. New material allow the body to recover to it’s original form after an impact. There are no standard lights as we know, replaced by DS Light Veil which curtains the front and rear of the DS X E-Tense. The whole of the front illuminates white, the rear red. The people throughout DS Automobiles share one thing, passion for automobiles and this is clearly seen in the concept 2035, DS X E-Tense. I will be looking forward to the future a lot more if cars are going to be as good as this creation.